Congrats on the new truck I hope you enjoy every ride in it. Very nice color by the way! My coolant normally stays pretty full I just noticed 2 days ago it has dropped a little . 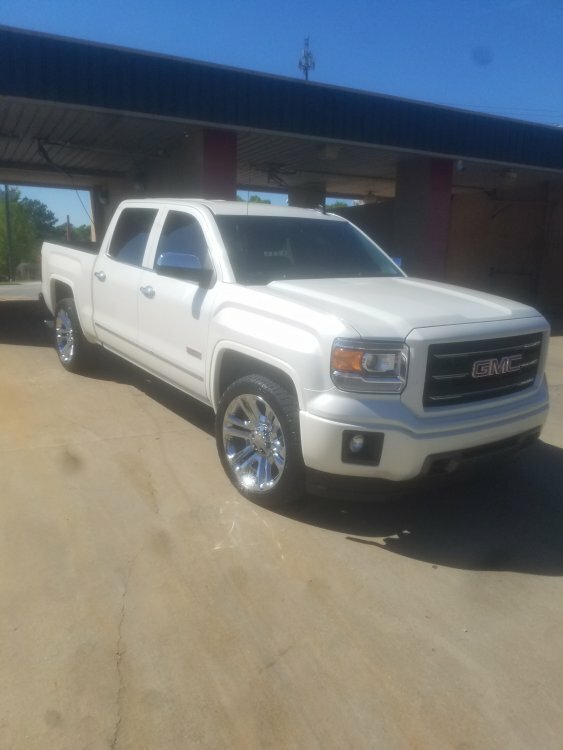 Which I will get it topped next week when I get my oil changed the trucks hasn't been to the dealership for service since the last oil change and rotation in September. Yeah I have the Rancho shocks I would have to look around and see what's out there that's better. Well knock on wood the truck has been trouble free since getting all of these things serviced and it rides and drives great so it is what it is all of it man made so issues can happen. Here are some pics of when I first got the truck Still had the original tires on it and original battery. Also I got all the owners Manuals and things still in plastic. Only Things I've done extra to the truck is a flowmaster muffler to make the 6.2L sound awesome. When I bout my truck I bought the Extended Warranty which covered most parts up to 75k. The truck was Originally purchased Brand new by the first Owner in Florida he then moved around 2015 or 16 to New York. Not sure if the snow and weather affected the truck up there. But I took the truck in for service and the Tech At GMC told Me That the Oil pan had a very small break in the seal and that it need replacing before it starts drip ping every where. There was NO LEAKS OR NOTHING IN MY DRIVEWAY. So sense it was under powertrain warranty why not go head and let them change it at no cost to me right ? Next thing while looking around under the hood of the truck I NOTICED THE CRIMS ON THE OIL COOLING LINES HAD STARTED TO SLIGHTLY LEAK. THEY ALSO FALL UNDER POWERTRAIN SO I GOT THEM REPLACED AGAIN NO COST TO ME. But The Oil Leaks On the cooling lines are pretty common for these trucks. Also I think between Florida heat and New York snow the rubber expands and contracts alot more I guess. I'm no expert either! The Trail Brake controller user to Chime out of the blue sometimes so while I had the warranty I told them to check it out so they just replaced it. Hey Everyone I'm Fairly New On Here & I Had A Few Questions. First Off Let Me Give You Guys The Back Ground History. 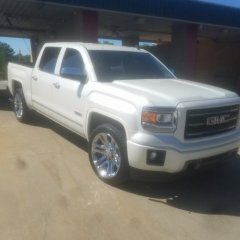 I have a 2014 GMC Sierra SLT 4WD with the All Terrain Package 6.2L I Got The Truck in Nov of 2017 With 51,306 miles One Owner. So Far I have replaced the Following: New Battery at 54k New Michelin tires at 62k New Oil Cooling lines 70k Front Diff washer and Fluid Change 70k Rear Door Lock Actuator New Trailer Brake Controller New Oil Pan & Seal at 65k I currently Have 77,700 miles on the Truck I'm wondering what other maintenance Things Should I look at Changing. The First week of April I'm Going on Vacation To Mrytle Beach 6 hour ride From Ga. So I want to make sure my truck is 100% ready. My Brakes feel a bit ruff so I'm ordering new pads and rotors All the way around. Just wondering what other owners are doing to Keep There Trucks Up.